One of the outputs of this action was the European Handbook of Crowdsourced Geographic Information where members of Heidelberg GIScience research group contributed several chapters in this book. 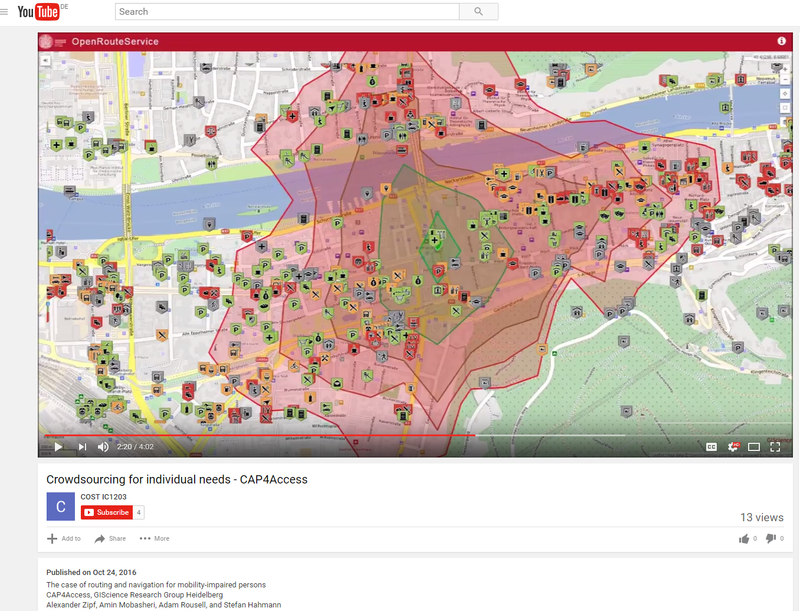 Recently, the cost action asked us to provide a video of our book chapter entitled “Crowdsourcing for individual needs - the case of routing and navigation for mobility-impaired persons”. This short video is now online. Enjoy watching it! Zipf, A., Mobasheri, A., Rousell, A., Hahmann, S. (2016). Crowdsourcing for individual needs - the case of routing and navigation for mobility-impaired persons, a book chapter in C. Capineri et al., eds. European Handbook of Crowdsourced Geographic Information, Ubiquity Press.